I once remember reading a piece about a slogan used by the US Army’s rangers, which went “travel light, freeze at night”. It has kind off stuck with me and I often hear myself repeating it quietly when packing for a trip or expedition. The great thing about the way gear is evolving, however, is that the slogan isn’t really true in the same way anymore. Gear has gotten lighter, better and warmer over the past decade and that is as true for mountain tents as it is for fleece jackets, sleeping bags and all of the other mountaineering gear that once uses. Take the MSR Twin Sisters tent from Cascade Designs (the same company that produces the great range of MSR stoves as well as great products such as Therm-a-Rest sleeping pads and Platypus hydration gear. The Twin Sisters tent is a no-frills lightweight tent. But it is also one that can stand up to pretty serious weather and abuse. The first thing that sets the Twin Sisters apart is that it is just a single wall tent and it doesn’t come with any poles. That would seem to put it into the category of tarps and other lightweight shelters that are pitched using an overhead rope (say slung between two trees) or using trekking poles or ski poles. But what makes this a little different from those sorts of fair-weather shelters is that it has snow skirts to keep out the rain and snow and also to help bed it down when pitched over snow. That makes it an incredibly versatile purchase because it is great for everything from mucking around in the summer in the woods to going ski touring or mountaineering. Its biggest virtue is lightness. 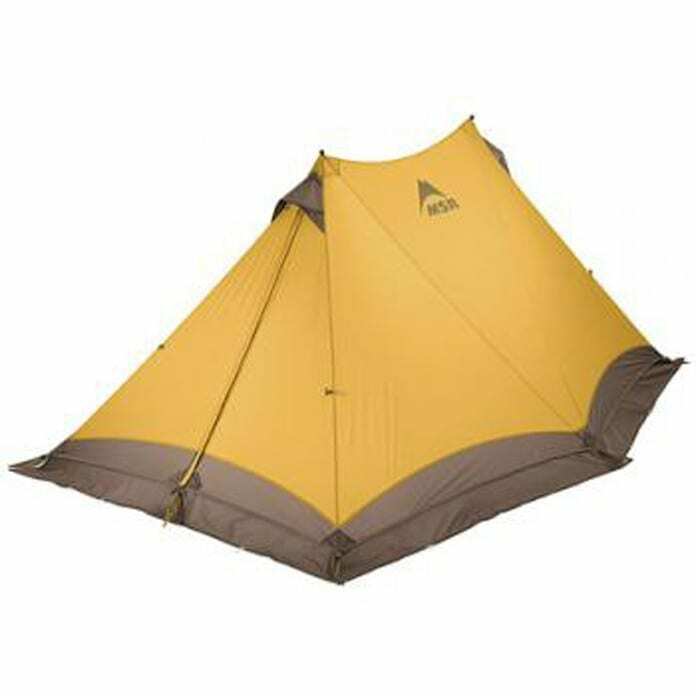 This tent clocks the scales at not much more than 1 pound (800 grams) which is easily a fifth as much as many other expedition grade tents such as the Trango 2 weigh. It sheds snow well, holds up against heavy winds and generally is loved by those who use it. That said it is still a fairly rudimentary shelter. You will have condensate building up inside and freezing if it is cold. And if there is wind that will fall onto you. This is not a hotel-style accommodation tent that you might get if you were to buy a heavier twin-walled tent. But if you want to travel light and not pay too much, then the MSR Twin Peaks is a pretty darned hard tent to beat. I imagine that mountain marathon runners and other adventure racers will take this up in time. There are rival designs out there, some may even be a bit lighter, but few will be as good.